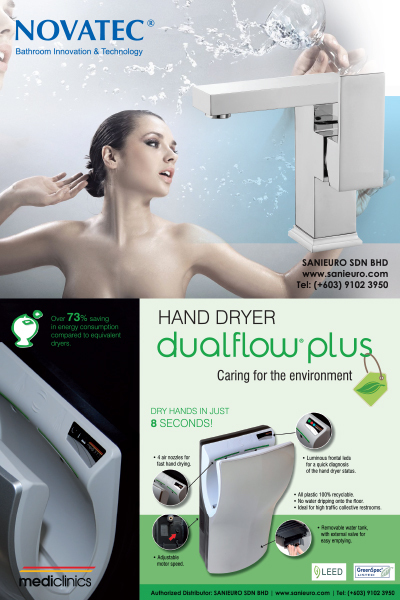 With more than 30 years experience in bathroom, kitchen and sanitaryware products, we have now established Sanieuro Sdn Bhd, our latest outlet to serve customers looking for high-quality and reliable Commercial Products under the NOVA brand name. We offer customers a wide range of the latest commercial products, which conforms to various international standards. These include environmental friendly sensor based products, namely sensor based faucets and flush valves including self closing taps. Other washroom products are soap dispensers, receptacles, paper towel dispensers, toilet tissue dispensers, jumbo roll toilet tissue dispensers, shaving mirrors, shower seat, towel rack, t-bar, grab bars and other washroom accessories. Our products have gone through years of research and commercial testing, and are developed based on our experience in the industry. We stand by all our products and assure you a reliable quality you can depend on.